The Heart of the Matter: Excited to Help Launch The Correspondent! If you read my stories and periodic blog posts, you know I have an interest in the shortcomings and failures of establishment media. Around the time I wrote The God’s Eye View, that interest led to an online friendship with Jay Rosen, a media professor at NYU. I’ve been reading Jay’s blog PressThink for years, and he’s one of the most insightful people I know on how media works and why good journalism is struggling. 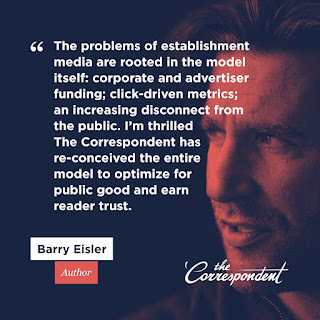 About a year ago, Jay asked if I’d be interested in helping get out the word on The Correspondent, a Dutch news organization expanding into the English-language market. As soon as I looked into it, I was hooked. I think the concept is exceptionally well-conceived, with as good a chance as I can imagine not just of serving readers, but of providing a healthier model for how to cover what’s newsworthy—a model other organizations might emulate. The exciting part is the principles that make it go. These are different from any news site you can name. Start with no ads, the key move the Dutch founders made. Downstream from that original “no” are others, equally welcome. No click-baity headlines. No auto-play videos. No ugly promos sliding into view as you try to read the article. No “sponsored content.” (No sponsors at all.) No third party—the advertiser—in between you and the people trying to inform you. No need to track you around the internet, or collect data on your browsing habits. No selling of your attention to others. Also: no controversy-of-the-day coverage, which happens when editors from different newsrooms react to the same data showing clicks and taps going to a few “hot” stories. These are typically the stories that trigger outrage in the most people. The people at The Correspondent have a phrase for it. “Your antidote to the daily news grind.” If that's an idea you can get behind, then get behind The Correspondent. Join our club. Now for the next principle, equally basic. This is not an exclusive club. It’s extremely inclusive. Two reasons I can say that. Yes, you have to pay to be a member. But you pay what you feel you can afford. The Correspondent believes you are smart enough to figure this economy out. A paying membership is the other side of the coin that reads: no ads. And no ads, as we have seen, has all those welcome effects downstream. The other reason I can say “extremely inclusive” is that The Correspondent is not selling digital subscriptions, as the Washington Post, the London Times, and most local newspapers nowadays do. Paid subscription is a product-consumer relationship: you pay your money and you get the product. If you don’t pay you don’t get it. Membership is different. You join the cause because you believe in the importance of the work. If you believe in the work, you want it to spread, including to non-members. 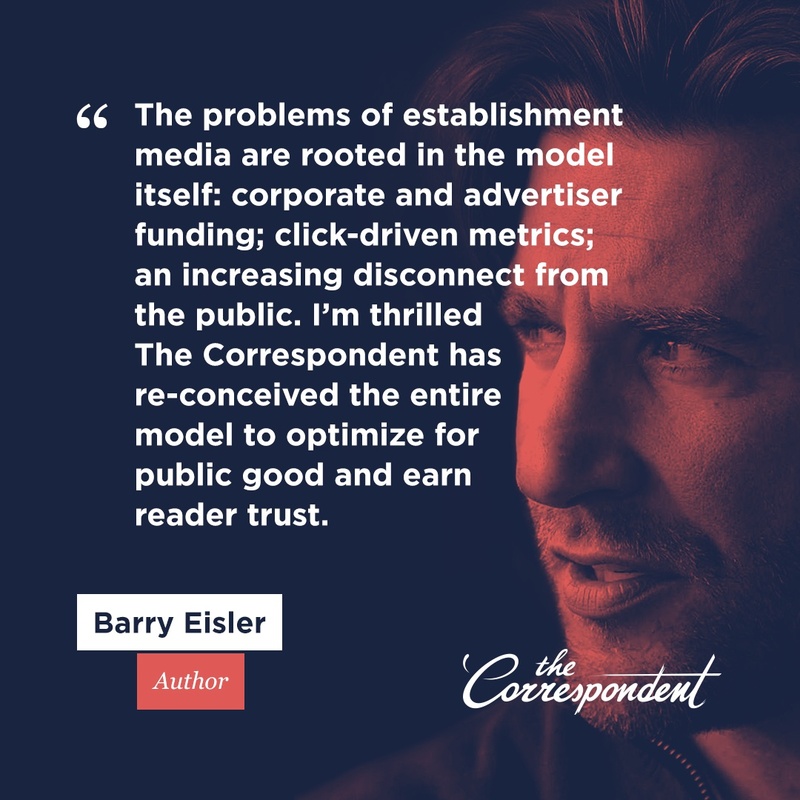 If The Correspondent’s membership campaign reaches its goal of raising $2.5 million by December 14, it will hire a staff and start publishing, in English, in 2019. When that happens, there will be no “meter” measuring how many articles you have read this month. No one will ever get that notice, “you have used four of your five free clicks.” Any link that comes to people in their social feeds will be clickable and shareable, without limit. In this way it is more like public radio in the U.S. Members who believe in the public radio mission support their NPR station, but everyone can listen. The differences compared to the NPR system are important too: The Correspondent will have no corporate sponsors. No government funding. And thus no fear of that money getting cut off. Which in turns means no tendency toward false equivalence, no incentive system for “he said, she said” journalism. These are deeply-woven patterns for which I have often criticized NPR. For more, here are their 10 Founding Principles. And here’s an article from De Correspondent’s founder, Rob Wijnberg—The Problem With Real News—And What We Can Do About It—about why the primary problem isn’t fake news, but rather real news. Please consider joining this terrific news organization and please help me spread the word by sharing this post. Thanks.